First of all, great post Hutch! I love the visual comparison you’ve provided and the thorough breakdown. There are a few things, however, that may be overlooked. 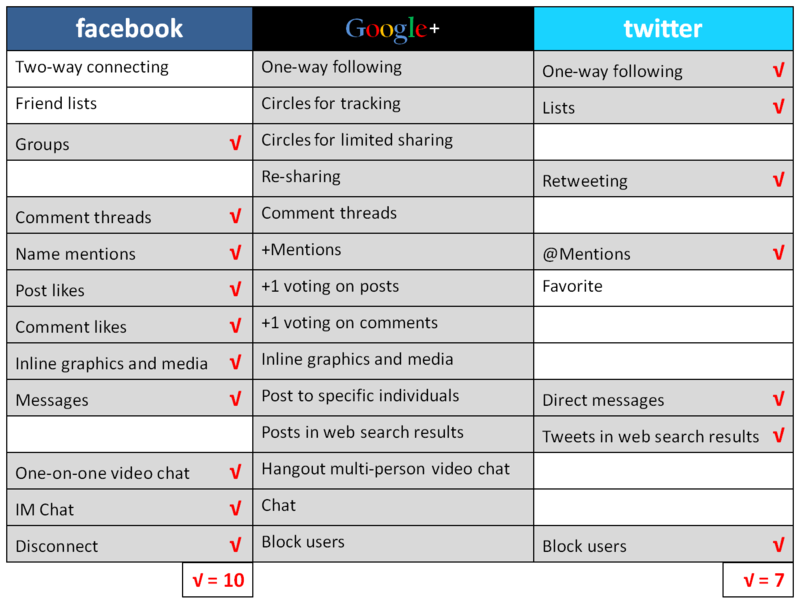 Although Google+ has more features in common with Facebook than Twitter, Facebook as a service has a lot more features than Twitter period. Therefore, it would make sense, based on the sheer amount of features that both Google+ and Facebook have, for them to have more features in common. Twitter is a very rudimentary service and its really a cave man version of Google+. You can do one-way following, like in Google+ but the lists in Twitter aren’t as robust. You are limited to the number of characters you can write and although you can post Tweet Pics, they are not implemented very well and usually not worth it. Other than, Twitter doesn’t really have any features that Google+ doesn’t. It just has more of a user base, but I’ve heard that activity on Twitter has dropped more than activity on Facebook since Google+ was released. The other thing that I think may help Facebook survive more than Twitter, is the emotional attachment its users have. Facebook users have hundreds of pictures, friends that they’ve built up over years, family relationships listed, their favorite activies, movies, books and everything “liked”. Each Facebook user has gigantic investment in their profile and network of friends. Although the same can be said for some Twitter users, I think the overall majority would be able to just pick and go much easier than Facebook users. From a complete logical and scientific perspective I think your article hit the nail on the head. I personally think Google+ or a similar service will take down both Facebook and Twitter if those services don’t implement serious upgrades. Again, great article, I’m just taking it from a slightly different angle. I’ll be looking out for your future articles! Thanks Anson. I’m seeing people on Google+ declaring they’re winding down their Twitter activity, and ramping up Google+. It’s amazing, really. Another good point I’ve seen made is that on Facebook, things like Farmville will keep people there. I do like the way you outlines the things that will keep people there: photos, prior posts, and most importantly, their existing social networks. Twitter is more ephemeral in terms of relationships, making it easier to leave there than it would be to depart Facebook.